Skyfall opens with a chase scene that culminates in Bond's partner accidentally shooting Bond instead of shooting the bad guy. 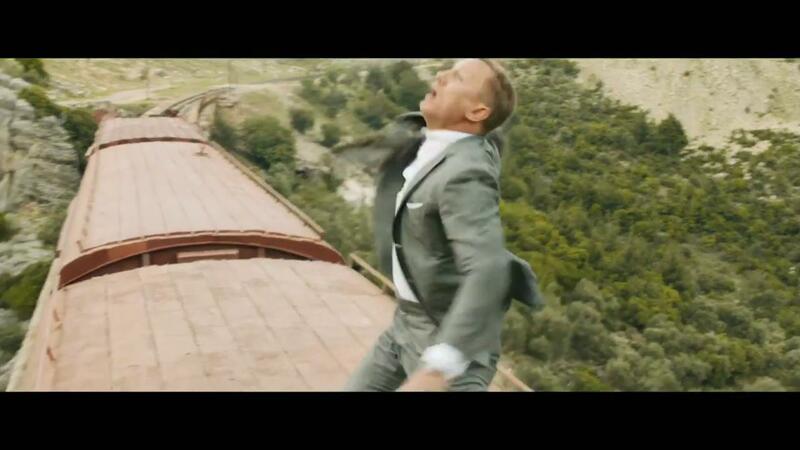 The bullet hits Bond hard enough to blow him off a train into the river below, and everyone concludes that he died. Later, Bond turns up alive and shirtless, sporting a shrapnel wound (which he is touching in the picture below) received from the bad guy -- but no apparent injury from the bullet that blew him off the train. I am surprised no one has suggested a bullet proof vest as the explanation. The first shot, hitting Bond in the shoulder, is above the location of any kevlar plates. This shot leaves an entry wound and shrapnel. 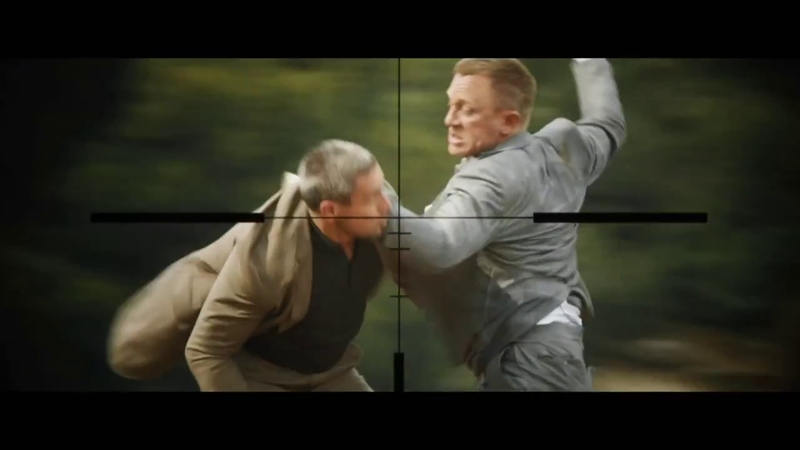 The second shot, that knocks Bond off the train, makes impact around his ribs on his right side. If Bond did have a bullet proof vest on, this area is likely to be covered. The impact from the bullet is transferred through the kevlar plate/s onto a larger area of Bonds body. Rather than penetrating his ribcage, and leaving an entry wound, the vest stops the bullet. Stopping the bullet before it enters his body imparts a lot more force onto Bond, which explains him being thrown off the train. It also explains the 4 broken ribs and minor organ damage. Bullet wounds are typically puncture wounds, deep and localised. Without a vest, Bond would have suffered much more serious organ damage as the bullet tears through him. Bullet proof vests typically leave blunt trauma injuries, affecting larger areas, and are not likely to leave scarring. One direct bullet wound is not likely to break 3 ribs, however the impact through a kevlar plate definitely is. James Bone is shot twice in the opening sequence for the film. Once while driving the Backhoe digger on the train. He is shot while rotating the Backhoe around 180 degrees. The shot hits him in the upper right shoulder, where he will later remove the shrapnel. Eve shoots Bond while he is fighting on top of the train. The impact of the shot throws him off the train and into the river. We know that James hear M announce to Eve to take the shot over the radio, but James is more thrown then jumps when the shot is taken. So it's doubtful that he faked being shot. When James Bond falls into the river he goes over a water fall. During this sequence he hits the bottom of the water falls and sinks into the water. At this point you can see bubbles coming from his right side ribs. As shown in this image. I've circled the two locations where he has been shot. In the opening credits of the film only one bullet hole is shown for the iconic imagery of Bond. This bullet wound is in the location where he was shot driving the Backhoe. The hole appears several times during the opening credits, in shadow figures of Bond and in a cardboard target of Bond. 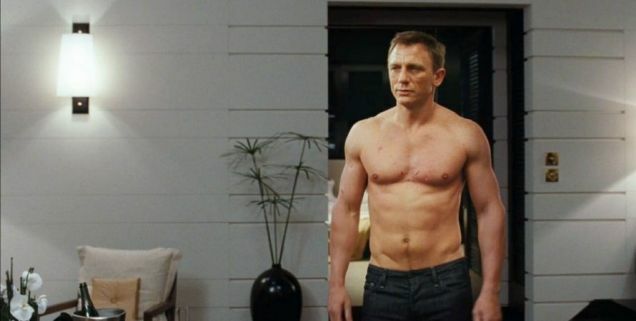 Later in the film James Bonds appears shirtless, but sporting only one bullet wound. In the interview sequence with the bad guy (sorry, forget his name, that's a movie joke). We are only shown one bullet wound, but M is blamed for the wound. So this raises the question. Where is the second bullet wound caused by Eve when she shot him on the train? It appears only once in the film, the moment when he hits the water. You can see two distinct injuries on Bond's right side. One in his shoulder, and one in his ribs. Later in the film. Eve and Bond are discussing the shooting that went wrong. This happens just after he enters the new underground base for MI5. He tells Eve the shot only "cost me 3 ribs". Yet, later in the film we see him shirtless without any wound in that area. I always thought that this large wound in his upper body was from Eve's sniper shot. This wound is also emphasized heavily during the title sequence, which makes sense to me, since it was rather the sniper shot that "killed" him and not those rather small grazing shots from Patrice. I think the shots from Patrice only left some small wounds that healed easily and didn't leave any further scars (and you don't see any large blood stain on his upper body after Patrice's shots). This could also be the reason why Bond didn't discover those shrapnels earlier, when operating the sniper wound shortly after the shot. They just "got lost" in the more severe injury he received from Eve. EDIT: As to your updated question, I really like the interresting viewpoint of Bond faking getting shot and your reasoning is not bad. But from the emphasize of this significant wound during the title sequence and no signs of it during the train chase (after getting shot at in the crane), I still stand by my answer. And in the end, don't forget the recoil. Ok, a bullet throwing him away that heavily is probably not that realistic in the first place, but Bond alone doing this? And likewise, whereas I understand your explanation of Bond's reasons, I would still doubt that he would abort this important mission just because he feels insulted by M. Of course he is upset after actually getting "killed", but aborting the mission (which he was still confident to succeed in) and playing dead just because M ordered Eve to shoot without him actually being hit would be a bit too childish from him. In the end Eve could've just hit Patrice and the mission succeeded, which he wouldn't even realize had he just thrown himself off the train (and into a possible death) right after hearing the shot. And he isn't one of the people getting nervous when hearing shots at all. EDIT: Ok, after rechecking it (and thanks to Shane's/your comment), I have to correct that you can indeed see a large blood stain right after Bond is shot by Patrice inside the crane. So this renders my theory of the shoulder wound being from Eve's shot totally wrong. Nevertheless I'll leave my last paragraph as it stands, even if I'm for now a bit more unclear about Bond faking his death and might start to tend to your theory. Although I could not find any evidence to support my answer, I am trying to give the answer as best as I can with my own proofs. I am posting 3 sequences of the gunshot. 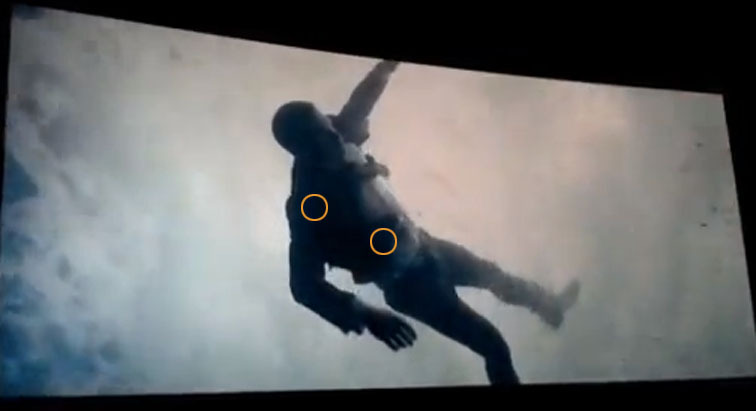 Now if you look carefully, the cross-hair was meant to be shot on the right side of Bonds body on a height of the chest. 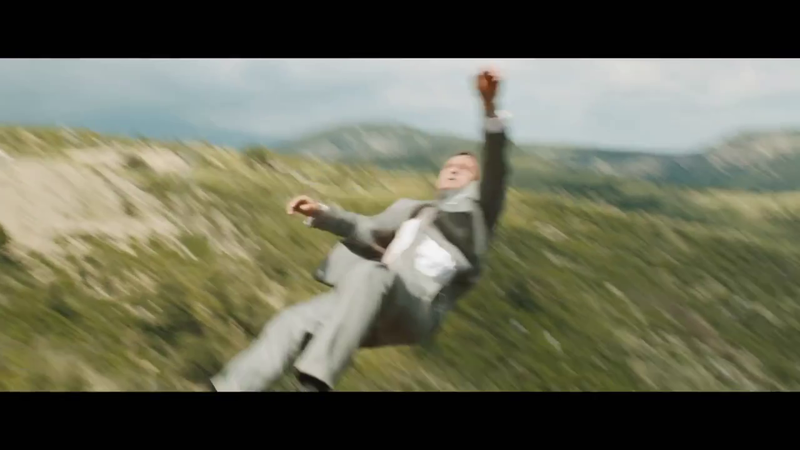 In the second scene, we see the right hand of Bond is more bent, as if something has struck hard and the blazer on the right side is more spread to outside. And in the final snap we see, right hand is lower than the left hand meaning again he has been struck on the right side. So we can conclude the bullet struck him on the right side between shoulder and belly (most probably on the right side of the chest). That is why we never see the wound. EDIT: I do not think Bond was faking the shot. Wikipedia clearly states that Eve accidentally shoots Bond , allowing Patrice to escape. Bond goes missing, presumed dead.. So the bullet maybe grazed him and that is why it did not make a severe wound to be seen! Missed all the major organs. It's a big possibility that the two shots were extremely close to each other and hence the one "iconic" wound in the opening sequence, imho. Not the answer you're looking for? Browse other questions tagged plot-explanation james-bond skyfall . Does Patrice wound Bond in the initial scenes in the right or left shoulder? 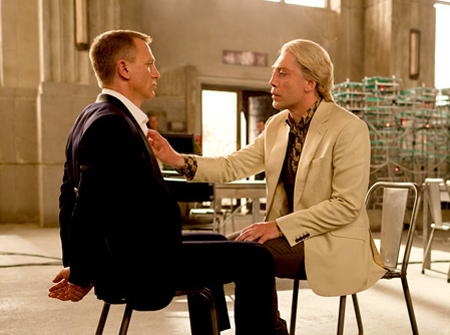 Why couldn't Bond have backup at the battle of Skyfall? Does the ageing theme in Skyfall contradict the rebooting of the Bond franchise? Where does Skyfall take place in the Bond timeline? Where was the Scottish Skyfall scene filmed? In Skyfall, why did M order Eve to "take the shot? In Skyfall, what is the significance of M's post-mortem gift of a porcelain pug to Bond? Why didn't Eve keep shooting at the train scene? Who is the Bond Girl in Skyfall? 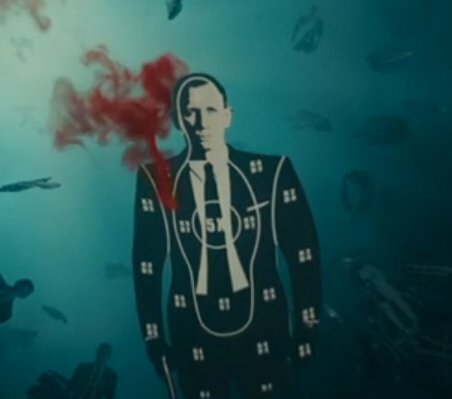 Was this scene in Skyfall an homage to the 007 Goldeneye video game?